The scientist who discovered the age of the Earth also helped end the use of lead in gasoline and other products in the United States. Sunday night's episode (April 20) of "Cosmos: A Spacetime Odyssey" explored the life of Clair Patterson, a geochemist who pinpointed Earth's age for the first time and also uncovered a secret: Lead contamination is a major and potentially deadly problem. The newest episode of "Cosmos," called "The Clean Room," takes viewers on a tour of Patterson's work and the industry that fought him as he tried to learn more about lead and its harmful effects. "Patterson had now been at it for six years, doggedly tracking down and eliminating the many sources of lead that were compromising his instruments," said 'Cosmos' host Neil deGrasse Tyson during the show. "He had built the world's first ultra-clean room. He was finally able to measure how much lead was actually in the rock, one whose age had already been established. Now, at last, Patterson was ready to tackle the iron meteorite." Eventually, after years of research, Patterson was able to say that the Earth was born about 4.5 billion years ago. Lead ban in the U.S. But before arriving at that final answer, the scientist had to overcome some difficulties. As Patterson tried to measure the lead in his zircon crystals, he kept getting wildly different results. Slowly but surely, Patterson realized that lead was contaminating many things in the environment. He learned that using lead in gasoline meant spewing the contaminant into the environment, potentially poisoning children and adults. The levels of lead Patterson found in the environment were not natural, as petroleum industry officials claimed. Instead, human-made products containing lead affected the environment and public health, Tyson said. For humans, even trace amounts of lead are unsafe, Tyson said during the show. After much time and effort, Patterson's scientific work with lead paid off, leading to a ban on lead in products like gasoline, canned goods and paint in the United States. The episode also used the Grand Canyon to explain how sedimentary layers in geology work. Through visual effects, Tyson was able to explore the layers of the Grand Canyon to illustrate how difficult it is to measure the Earth's age based on layers of material laid down over long spans of time. "We know from observing this process, because it still happens today in oceans and lakes around the world, that sediments can be laid down at widely different rates," Tyson said. "It usually happens very slowly, say a foot of sediment per 1,000 years, but when there's a rare catastrophic flood, it can happen much faster, as much as a foot in a just a few days." Before Patterson conducted his work, scientists had tried to use the layers of sediment to estimate the age of the Earth. Because the sediment was laid down at different rates, however, the researchers' numbers were wildly different and the findings didn't stand the test of time. "Cosmos: A Spacetime Odyssey" is a reboot of the astronomer Carl Sagan's beloved "Cosmos: A Personal Voyage." 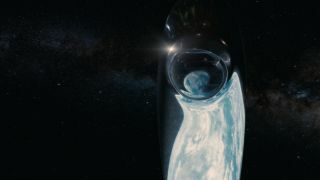 "Cosmos: A Spacetime Odyssey" airs Sundays at 9 p.m. ET/PT on Fox. It will be rebroadcast with extra material on the National Geographic Channel on Mondays at 10 p.m. ET/PT. Check local listings. To catch up on "Cosmos," you can watch the previously aired episodes for free via Hulu.